Iranian singer Salar Aghili performed in the central Iranian city of Isfahan on January 12 and 13, 2018, without the female members of his band due to interference by local officials at the Culture and Islamic Guidance Ministry, the Center for Human Rights in Iran (CHRI) has learned. Shahrouz Balouchestani, a female flute player at the Isfahan National Orchestra, told the semi-official Iranian Labor News Agency (ILNA) on January 15 that she had performed for years without any problems, including in Shiraz, Fars Province, two months ago. But this time officials in Isfahan prevented the orchestra’s female musicians from appearing on stage. “Women are engaged in many professions alongside men in this country. Women are active members of the musical community as well, but in Isfahan, I don’t know why they can’t perform side by side with men on stage,” she said. “It makes no logical sense that Isfahan’s female musicians cannot go on stage in their own city,” she added. The following day, Culture and Islamic Guidance Minister Ali Salehi said he had “no problem” with females performing with an orchestra on stage. “From our point of view, there is definitely no problem with female musicians playing with an orchestra on stage and this should be the case in all parts of the country,” said Salehi on January 16. “Naturally, if mistakes are made, we should not repeat them,” added Salehi. Since 2013, when President Hassan Rouhani was voted into office promising a more open society, numerous musicians and vocalists saw their concerts canceled at the last moment. The vast majority of the canceled concerts had received licenses from the Ministry of Culture and Islamic Guidance. Cancelations of concerts featuring female vocalists and musicians have also been particularly frequent since 2013. In the Islamic Republic, women are prohibited from singing or playing musical instruments solo. 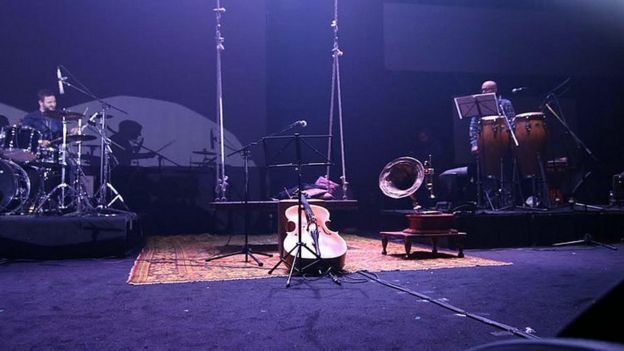 Musicians in Iran have long complained that conservative local officials, including prosecutors and the police, sometimes take matters into their own hands and disrupt or cancel concerts that have official permits from the Culture and Islamic Guidance Ministry. Despite positive rhetoric by the Rouhani administration on the issue, female musicians continue to face discrimination on stage. The Fajr International Music Festival this year, scheduled for January 10-20, 2018, includes fewer women musicians than in recent years. According to traditional female singer Hengameh Akhavan, many women refused to play in the festival because they were only offered unfavorable time slots. “Who sings at two or three in the afternoon? And who’s going to go to a concert at that time?” Akhavan told Khabar Online on January 16. Akhavan added that she has written to President Rouhani urging him to allow female singers to perform in cities other than the capital of Tehran. On December 26, 2017, a concert by singer Benyamin in Tehran was only allowed to proceed after his female cellist was removed from his band. “We had done all the usual official paperwork to have [our cellist] Melanie Avanessian on stage but unfortunately, minutes before the concert, she was prevented from performing,” said Akhavan. “In her honor, and the people who had come to see her, we left her seat empty by her instrument,” Benyamin’s producer, Salim Ahmadi, told ILNA on December 27. Some conservative clerics, most of whom oppose women performing on stage and sometimes musical performances in general, have pressured the Rouhai government to “clarify” its position on female musicians performing on stage. “The state must clarify its position on such matters,” said Ayatollah Hossein Mousavi Tabrizi, the secretary of the powerful Assembly of Qom Seminary Scholars and Researchers, on December 27, 2017.